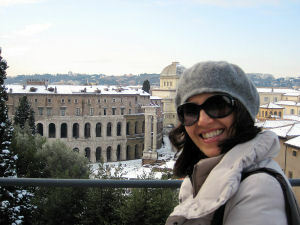 Marta Marsili Welcome You to "Guided Tour of Rome" - the most comprehensive and educational tours of the Eternal City! The Italian Government, in order to assure the integrity of its cultural and artistic patrimony, only allows licensed Rome tour guides to accompany visitors to the UNESCO sites. Since history and traditions are different from city to city, all Rome tour guides are required to be local. Tour guides are required to show their guide's badge. When you book a Roman tour guide, it is important check the guide's license number! Do not place yourself at risk by using an unregistered, unlicensed and illegal guide. Licensed by the Italian Government (issued by 'Provincia di Roma'). Member of ANGT (National Association of Italian Tour Guides). Years of experience in leading groups, individuals and families. Extensive knowledge of Roman history, archaeology and art history. Experienced in touring with special needs visitors. Specialized children's guide for Disney Cruise shore excursions. Fluent in English as well as other languages.